Anglian Water has awarded Clancy Docwra a leakage detection contract as part of its IMR Water alliance. Clancy Docwra will cover Anglian’s western region work alongside Kier, which covers Anglian’s eastern region. Around 50 roles will be transferred over to the contractor and will place “increased emphasis” on technological innovation to tackle leakage. Currently one of the leakage detection avenues utilised sees the deployment of noise-logging devices across the network on a temporary basis and uses audio technology to identify anomalies in water flow. Clancy will work with Anglian to roll this technology out on a semi-permanent basis, which will allow for earlier intervention when leaks occur. In the long-term, Clancy will work with Anglian to explore additional techniques to improve leakage performance. The business has been working in partnership with Microsoft to look at how the use of machine learning tools can be used alongside its expertise in the field to pre-empt and respond to likely leakage points across the network. Over the period 2017-18 Anglian reported its “lowest recorded level of leakage” – 183 mega litres per day (ml/d), below its target of 192 ml/d. 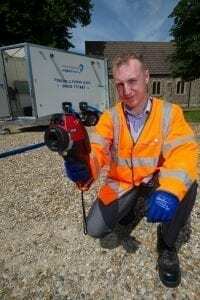 Sean McCarthy, head of leakage at Anglian Water, said: “We’re successfully driving down leakage volumes across our network, but at the same time recognise that we must do more to safeguard our resources. Ronan Clancy, associate director at Clancy Docwra, added: “Bringing leakage detection firmly into the Anglian alliance will allow us to drive greater integration with our maintenance and repair activity. “This will bring efficiencies in resource, as well as enabling an easier transfer of expertise across disciplines, ensuring we are attracting and retaining the best talent in the alliance overall. Anglian Water was visited by environment secretary Michael Gove last year at sites in Gazeley and Newmarket in Suffolk, where he learnt about the company’s “sector-leading approach” to leakage. Steve Buck, who is currently group head of finance and transformation at Centrica has been appointed as Anglian Water’s new chief financial officer and will join the water company in June.